This kit is designed to streamline the production of transgenic zebrafish for studying neurodegenerative disorders. The kit contains 19 plasmids consisting of four promoters, six fluorophores, and empty vectors with MultiSite Gateway® (Invitrogen) compatible cloning sites or multiple cloning sites for the easy insertion of genes of interest. A Tol2 Gateway-Compatible Toolbox for the Study of the Nervous System and Neurodegenerative Disease. Don EK, Formella I, Badrock AP, Hall TE, Morsch M, Hortle E, Hogan A, Chow S, Gwee SS, Stoddart JJ, Nicholson G, Chung R, Cole NJ. Zebrafish. 2016 Sep 15. [Epub ahead of print] doi: 10.1089/zeb.2016.1321 PubMed PMID: 27631880. 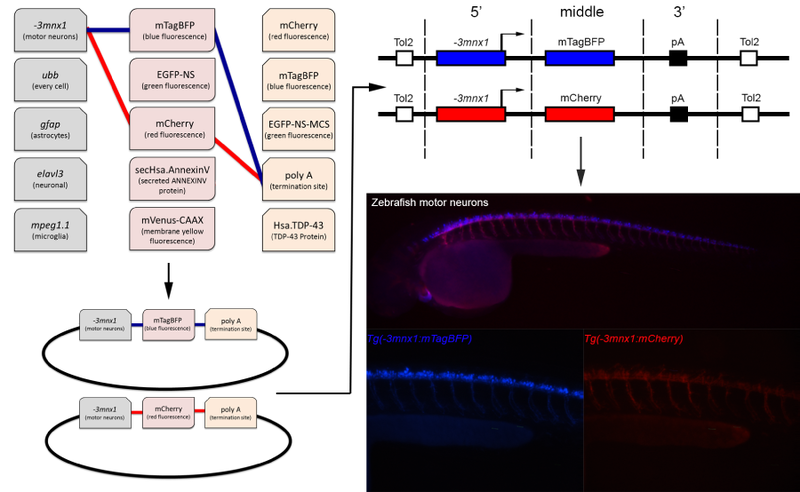 In order to streamline the production of transgenic zebrafish for the study of neurobiology, the Cole Lab has designed a Tol2 Gateway compatible toolbox based on the original Tol2kit generated by the Chi-Bin Chien lab (Kwan et al., 2007). This collection, deposited by the Cole lab contains a set of 19 vectors. These vectors can be easily recombined using MultiSite Gateway® Three-Fragment vector construction protocols. The final constructs can then be used to create transgenic zebrafish for the study of neurobiology and neurodegenerative diseases. An example of a transgenic zebrafish created with the Cole Lab toolbox to study the relationship between neurodegenerative disease and motor neuron degeneration. Two constructs are described here from the entry vector elements collated in this toolbox: pTol2pA2--3mnx1:mTagBFP, pTol2pA2--3mnx1:mCherry. Each expression cassette has a three prime SV40 polyadenylation signal (pA) in either the 3′ vector or backbone to aid expression.